9/11: Does the Truth Have a Chance? The years march on as we slip further and further from the World Trade Center attacks of September 11, 2001. Mainstream media won’t touch it, unless it’s in shameless defense of the neverending War on Terrorism that is used even today to “justify” attacks on countries around the globe. 9/11 and the media disinformation that has plagued it have set into motion over a decade of war, and there are still many unanswered questions surrounding that fateful day. But if we really want to understand why the world is at war, we must not let these important events slip into obscurity. After years of repeated lies, the truth is still out there. “In the US on September 11, 2011, the tenth anniversary of 9/11, politicians and their presstitute media presented Americans with “A Day of Remembrance,” a propaganda exercise that hardened the 9/11 lies into dogma. 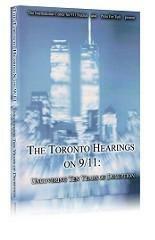 Meanwhile, in Toronto, Canada, at Ryerson University the four-day International Hearings on the Events of September 11, 2001, came to a close at 5pm. During the four days of hearings, distinguished scientists and scholars and professional architects and engineers presented the results of years of their independent research into all aspects of 9/11 to a distinguished panel consisting of the honorary president of the Italian Supreme Court who was an investigative judge who presided over terrorism cases and three distinguished scholars of high renown and judgment. The distinguished panel’s task is to produce a report with their judgment of the evidence presented by the expert witnesses.